Late Late Show with Craig Ferguson | What's On Tonight? The Late Late Show with Craig Ferguson is an American late-night talk show hosted by Scottish American comedian Craig Ferguson, who is the third regular host of the Late Late Show franchise. It follows Late Show with David Letterman in the CBS late-night lineup, airing weekdays in the US at 12:37 a.m. It is taped in front of a live studio audience from Monday to Friday at CBS Television City in Los Angeles, California, directly above the Bob Barker Studio. It is produced by David Letterman’s production company Worldwide Pants Incorporated and CBS Television Studios. Since becoming host on January 3, 2005, after Craig Kilborn and Tom Snyder, Ferguson has achieved the highest ratings since the show’s inception in 1995. While the majority of the episodes focus on comedy, Ferguson has also addressed difficult subject matter, such as the deaths of his parents, and undertaken serious interviews, such as one with Desmond Tutu, which earned the show a 2009 Peabody Award. 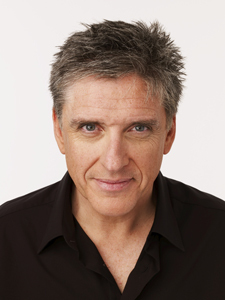 Craig Ferguson (born 17 May 1962) is a Scottish-born American television host, stand-up comedian, writer, actor, director, author, producer and voice artist. He is the host of The Late Late Show with Craig Ferguson, an Emmy Award-nominated, Peabody Award-winning late-night talk show that airs on CBS. In addition to hosting his own show and performing stand-up comedy, Ferguson has written two books: Between the Bridge and the River, a novel, and American on Purpose, a memoir. He became a citizen of the United States in 2008. Before his career as a late-night television host, Ferguson was best known in the United States for his role as the office boss, Nigel Wick, on The Drew Carey Show (1996–2003). He also wrote and starred in three films, directing one of them. 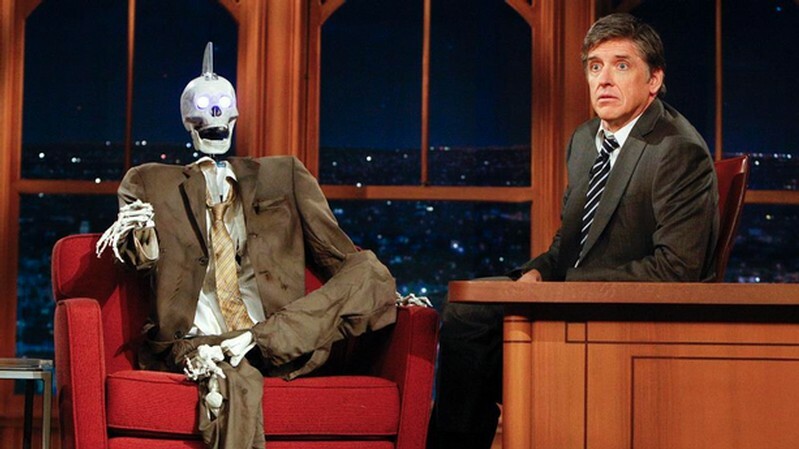 Geoff Peterson is an animatronic human skeleton that serves as the sidekick on the late-night talk show The Late Late Show with Craig Ferguson. He is voiced and operated by Josh Robert Thompson and first appeared on The Late Late Show on April 5, 2010. Often referred to as a “robot skeleton”, Peterson is a radio-controlled animatronic robot puppet designed and built by Grant Imahara of MythBusters. He has glowing blue eyes, a metal mohawk (which is replaced by a Santa Claus hat in December) and wears an oversized suit with his name scrawled on a contestant’s name tag from The Price is Right on his jacket, as well as Mardi Gras beads and a Super Bowl XLVII press pass around his neck. He serves as a co-host of sorts and Ferguson refers to him as “my gay robot pal.” He is most visible during the first half of the show (the cold openings, monologues, and Tweets and Emails segments), and the final segment, “What Did We Learn on the Show Tonight, Craig?”.